Godfried Schalcken became the leading portraitist of the citizens of Dordrecht and the court circle at The Hague, and also worked in London, where he lived from 1692-1697; his first influence was Gerrit Dou, who was his teacher. His early work, mainly consisting of small genre pictures, reflects a Dou-like attention to painstaking detail. By the 1670s, possibly under the influence of Caspar Netscher and Frans van Mieris, he started to adopt a much freer touch. By around 1673 Schalcken had become Dordrecht's most popular portraitist, producing elegant works that allied great technical fluidity with a subtle rendition of character. 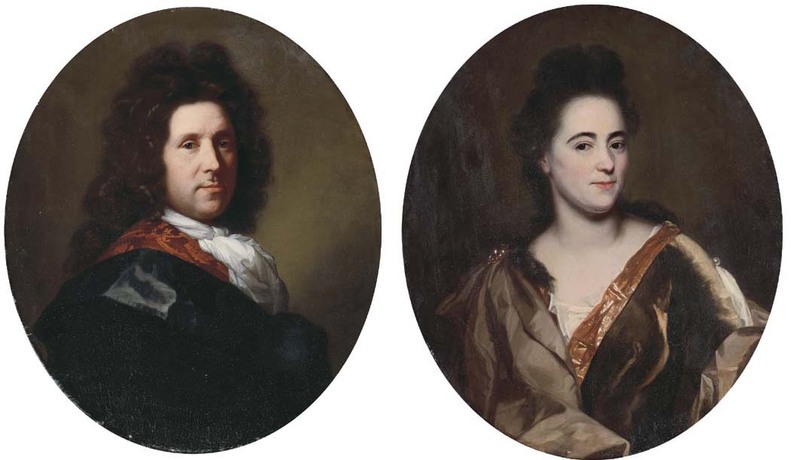 For a similar pair of oval portraits sharing the same dimensions, see those sold in these Rooms (10 July 1998, lot 36) depicting the artist and his wife, François van Diemen, dated 1707.